Helena attended the Gordon Research Conference on 'Thiol-Based Redox Regulation and Signaling' in Barcelona, where she presented a talk in the Ageing session. The annual LMS Rounders and Picnic on Wormwood Scrubs was a sunny but emotional afternoon, as we said farewell to our PhD student Lucie, who is embarking on her maternity leave, soon to be followed by our lab manager, Andrea. We wish them both and their bumps well! We also welcomed some new group members - our post-doc Claudia, and Marcela, who joins us as our lab manager maternity cover. Lucie joined colleagues from the Miguel-Aliaga and Hirabayashi labs at the annual Imperial Festival, showcasing the use of flies in scientific research to the general public. The stand featured a range of demos highlighting the advantages of Drosophila as a model organism. Helena is delighted to have been nominated for a SACA 2018 award. The SACAs (Student Academic Choice Awards) are organised by Imperial College Union to recognise excellence amongst staff. 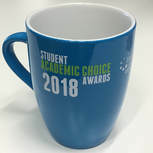 As a nominee, she is now the proud owner of a coveted SACA mug! Congratulations to the LMS on receiving its Athena Swan Silver Award! Several members of the Cochemé Lab have been involved with the Athena Swan initiative at the Institute: Helena was chair of the CPD (Continuing Professional Development) working group (2014-2016), and now leads the Families working group (2017-), while Fiona was a member of the CPD and Mentoring working groups. Farewell to two members of the Cochemé Lab: Fiona is moving to the University of Glasgow, while Joel concludes his Commonwealth Scholarship placement and returns to complete his PhD at VIT University in India. We wish them both luck with their future scientific endeavours! The Cochemé Lab attends the EDRC (European Drosophila Research Conference) held in London. Lucie and Joel both presented posters, while Helena was invited to speak at the 'Mitochondria' workshop. July 2017 - Click-PEGylation Paper Published! Congratulations to our PhD student, Lucie! Her paper 'Click-PEGylation - A mobility shift approach to assess the redox state of cysteines in candidate proteins' is published in the journal Free Radical Biology & Medicine. Read the paper here: van Leeuwen et al. 2017. The LMS Drosophila groups (Cochemé, Miguel-Aliaga, and Hirabayashi labs) met up with their counterparts from the South Kensington campus of Imperial College London (Gilestro, Dionne, Southall, and Windbichler labs) for a joint Fly Retreat at the Museum of London. Members of the Cochemé Lab attended the Royal Society meeting on 'Chemical biology approaches to assessing and modulating mitochondria'. Lucie presented a poster at the conference, while Helena chaired a session. Congratulations to our MSc student, Stephany! She was awarded her masters with Distinction, and received the highest ever grade on this course for her lab research project investigating fly stress responses and ageing. We are very proud of her achievements! Helena joins around 100 other Drosophila PIs at the 20th biennial EMBO Crete Fly Meeting. 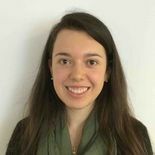 Congratulations to our Erasmus student, Esther, who was short-listed for the prestigious ‘Professor Chris Gips Foundation Prize for Young Scientific Talent in Medicine’. This prize is awarded annually for an excellent research project by a Dutch medical student abroad, with each medical faculty in the Netherlands nominating a single candidate. Well done, Esther! As part of public outreach activities, the Institute hosted a visit from the 'University of the Third Age' (U3A), an organisation which promotes learning amongst retired members of the community. The U3A group attended a series of talks, including a presentation by Helena on why the fly is such a useful model to study ageing and age-related diseases. Read the full news story on the LMS website. 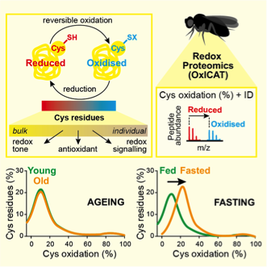 Our paper ‘Fasting, but Not Aging, Dramatically Alters the Redox Status of Cysteine Residues on Proteins in Drosophila melanogaster’ is published in Cell Reports. Read the paper here: Menger et al. 2015. This study is a collaboration with groups at the UCL Institute of Healthy Ageing and the MRC Mitochondrial Biology Unit in Cambridge. See here for news coverage of the publication on the LMS website. Congratulations to our Imperial College undergraduate student, Emma! She was awarded the prize for the best final year lab project, on her research into fly stress responses and ageing. Helena was selected to represent the Faculty of Medicine for the VIP launch event of the Women@Imperial showcase at the South Kensington campus, hosted by the Imperial College President Alice Gast. Together with Lucie and Esther from the lab, she demonstrated the use of fruit flies as a model for ageing research to members of the college, the general public, as well as invited guests including the Mayor of Kensington & Chelsea. Congratulations to Helena on receiving the Rank Prize Funds award for the best contributed paper at the symposium ‘Oxidative stress: Does it play a role in life histories and ageing?’. 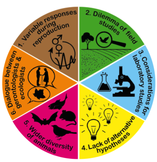 All participants at the meeting contributed to a review 'Oxidative stress and life histories: unresolved issues and current needs' published in Ecology and Evolution, which can be read here: Speakman et al. 2015.